TALLADEGA SUPER SPEEDWAY from pit road. 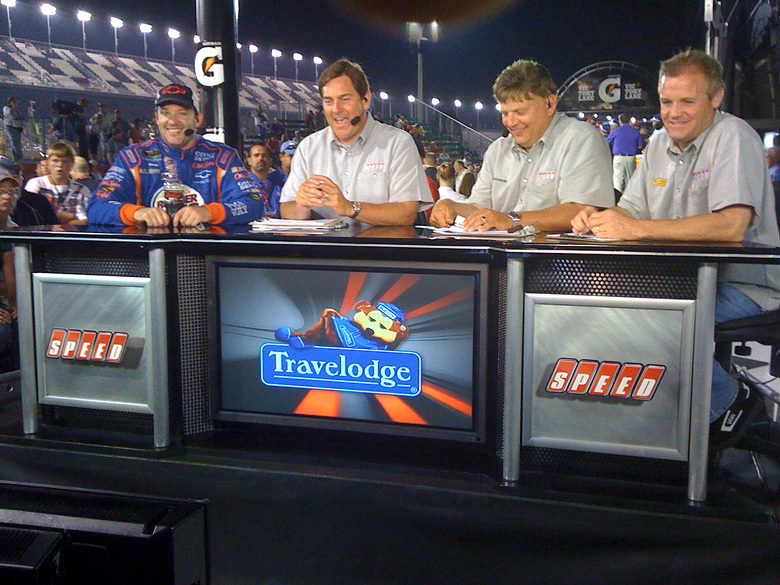 TEXAS MOTOR SPEEDWAY fom the SPEED booth .. The 2011 race seaon is HERE.. The 2011 race season is here starting with NASCAR testing at Daytona Super Speedway followed by the Rolex24 then NASCAR Speed Week. 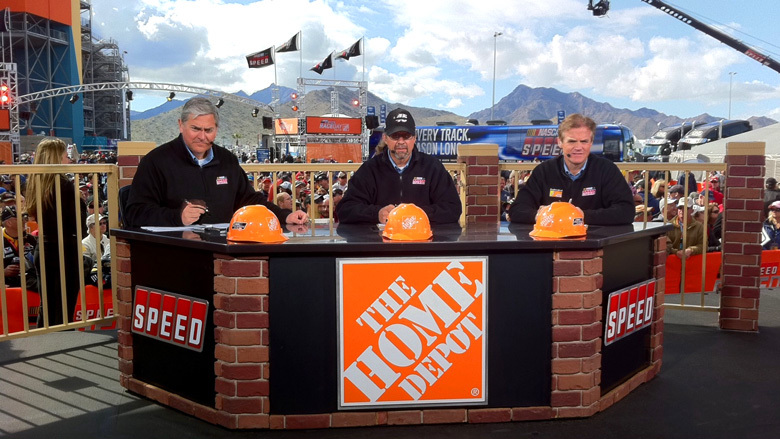 We have a new "Track Side Live" stage and new "Race Day" stage. 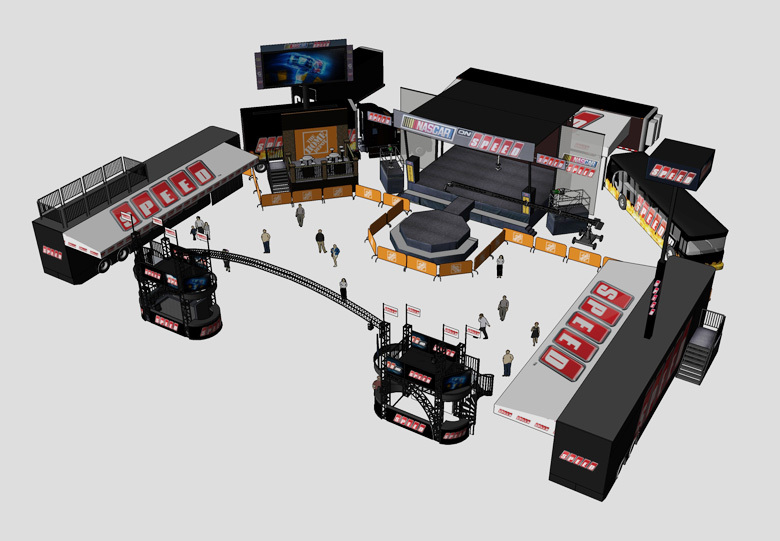 "Track Side Live" will be shot out on an open stage with a surrounding crowd. This is a total makeover and should definitely give the show a needed face lift. 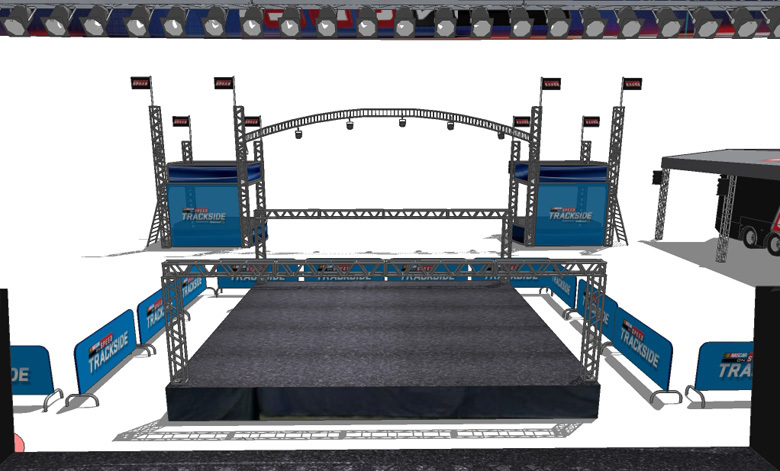 This is what I designed as a lighting and show package. TESTING and Rolex24 went smooth. 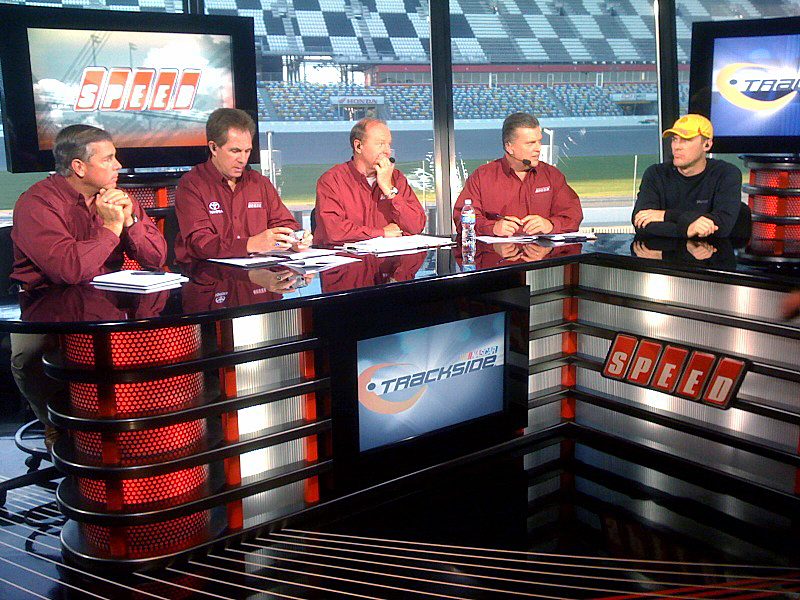 We had the Daytona studio with SPEED desk and probably the best looking background for any network all year long. 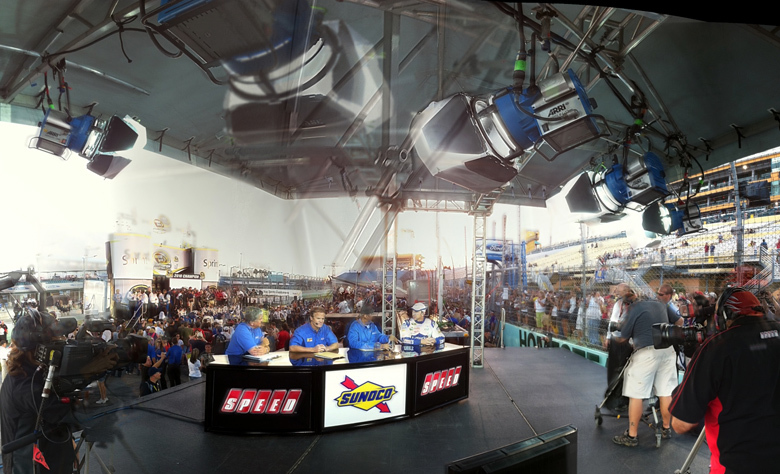 "NASCAR Victory Lane" has stayed the same but our "NASCAR Live" shows are shot in different track locations and "NASCAR Race Day" is on our old stage. Trevor Bayne WINS the Daytona 500 in his second SprintCup race. What a long race season this was. I started out with the Rolex24 in Daytona 42 race weekends ago and we have finally ended here in Homestead South Florida. Jimmie Johnson wins his 5TH straight cup title and doesnt seem to be slowing down. 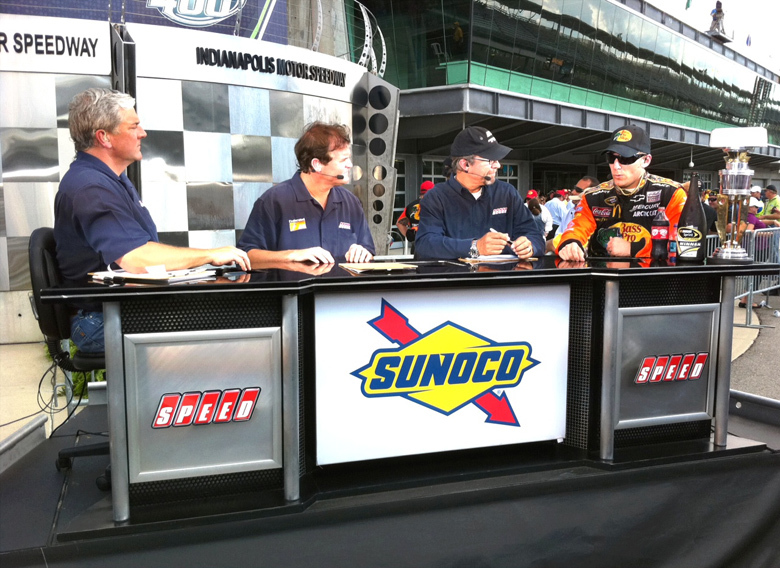 "Track Side Live", "NASCAR Live", NASCAR Victory Lane", "NASCAR Smarts" were the shows of the 2010 year for SPEED. 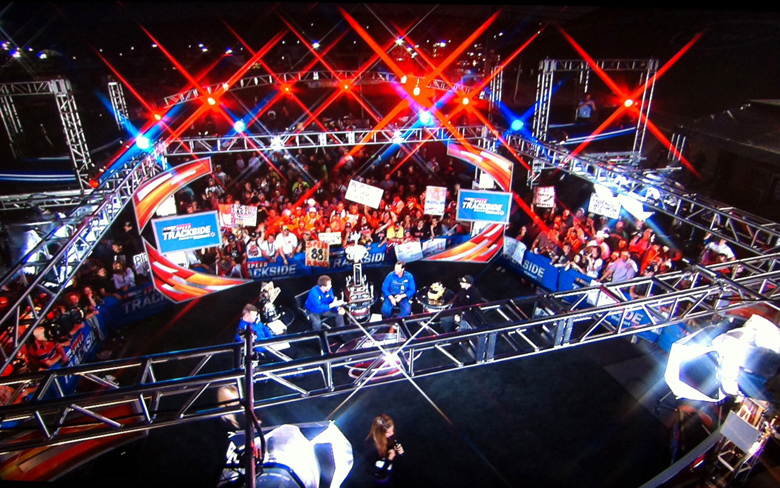 We shot @10 shows a week which equals 400 shows for the year. These are a few photos from the year. SOOOOOO LONG 2010 . . . . I have 2 months off before i leave for Daytona in early January..
: ) HAPPY HOLIDAYS ! May 20th my good friend DJ Roller from Liquid Pictures called me about an under water 3D iMAX movie he is shooting in the Bahamas. His film team had just returned from South Africa where they were shooting great white sharks for their film "The Last Reef". 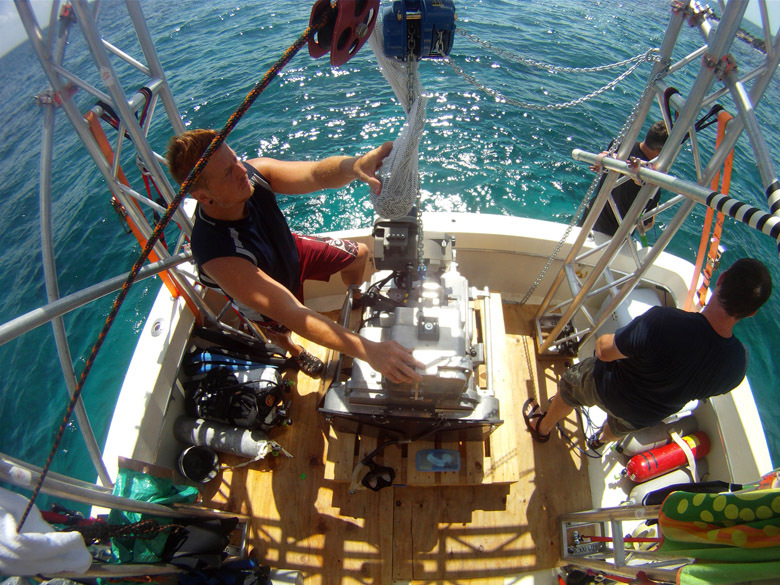 They were moving their production to Bimini (Bahamas) so they could shoot lemon sharks and dolphin out in the sand and grass flats off of the coast. 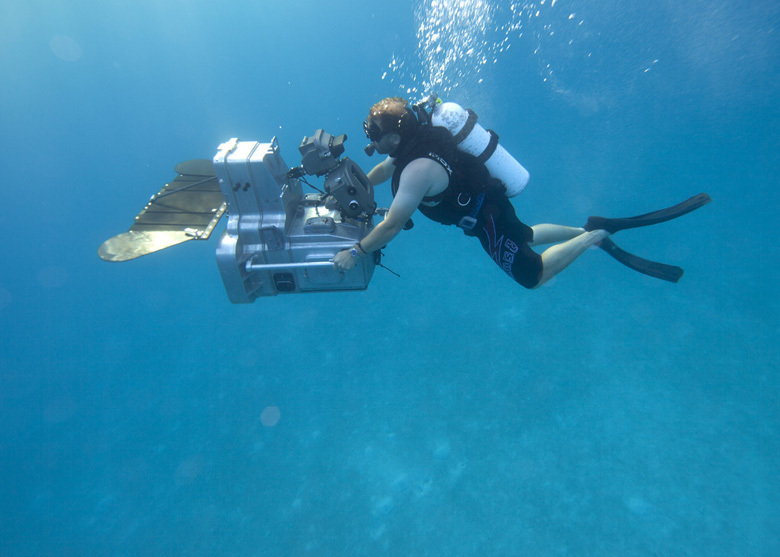 DJ has the only 3D RED underwater camera in the world, its an amazing piece of technology and rather large in its custom made under water housing. DJ called me about building a lifting rig/hoist to help lift his 550lb camera off the back of the boat and into the water. We are using 60'+ Hatteras that had a rear deck of 10'x12' and approx 5' off of the water. This may not seem like a hard quest but, this equipment has to be rented in the USA, traveled into the Bahamas, and has to work 100% RIGHT on the first try. We are on the small island of Bimini. 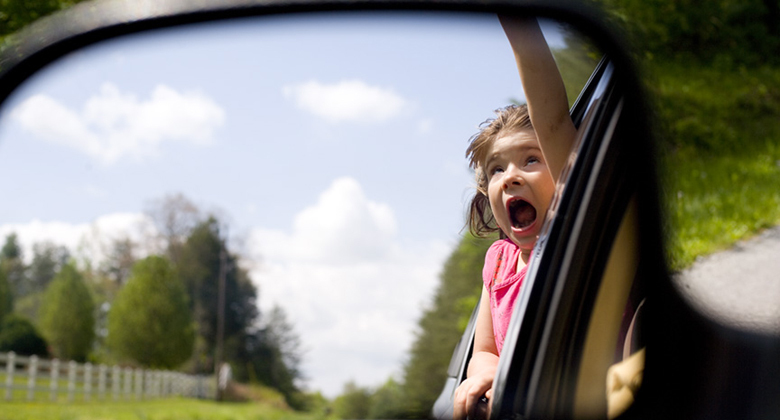 There are NO hardware stores, NO lumber stores, NO "ooooooooooops I need that" stores. I took the boat dimensions, drew it out, and between 2 rental houses here in Atlanta and Ft Lauderdale I got the gear. 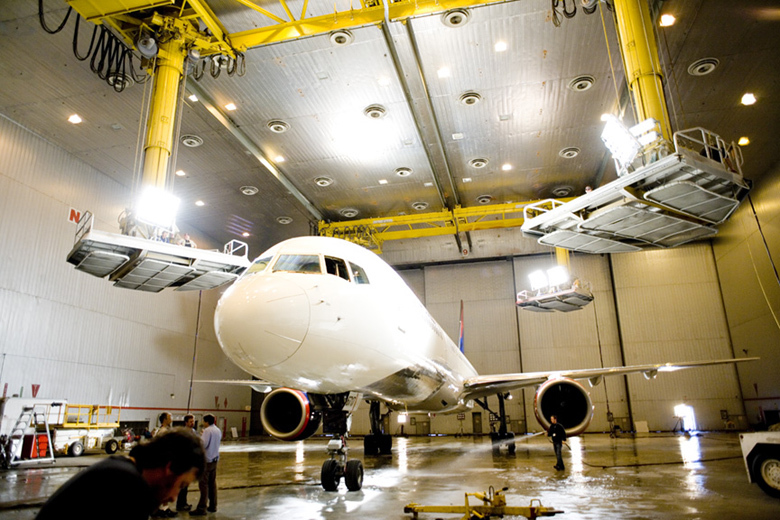 We flew over in 3 cargo planes, the camera and rig weighed almost 4,000lbs. Day#1 was spent traveling into the Bahamas, clearing customs, and transporting all the gear to the docks and rooms where we were staying. Day#2 I built my masterpiece,. 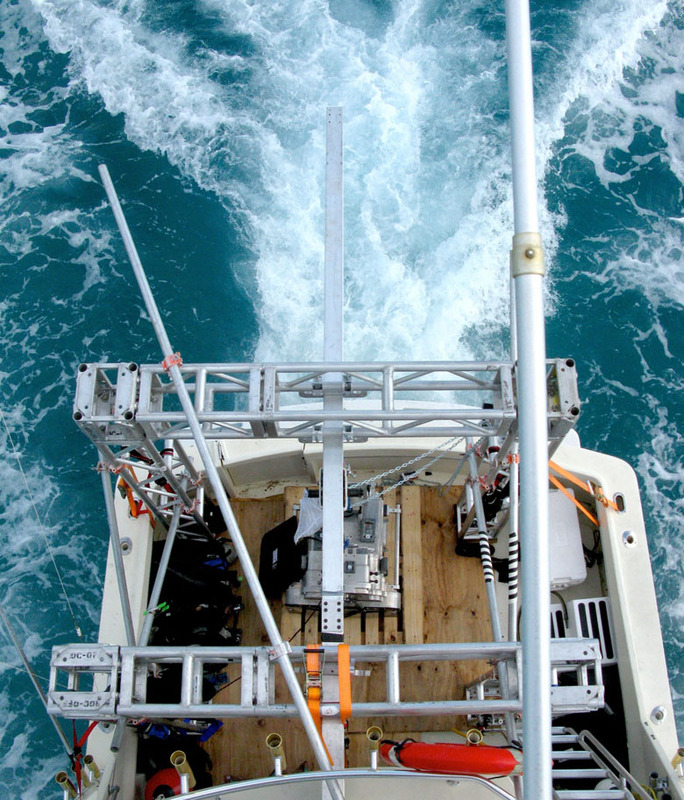 all 1,500lbs of lifting rig.. 12inch box truss, 10inch iBeam, speed rail, lumber + lumber, and enough straps to keep this thing from falling into the water while we were out at sea. Mostly built of 12" BOX truss from ROC-OFF in Ft Lauderdale and a 10" iBeam from Atlanta Rigging Systems, it all worked out perfect. Day#3 we went out to sea for the first time and had the camera launch down to 5 minutes... We would spot dolphin and could launch the camera in the same amount of time it would take to get our scuba gear on. We spent 7 days chasing sharks and dolphin in the Bahamas. DJ and his team left here and went to the South Pacific to finish filming. The iMax movie should be out shortly and something awesome to see. The iMAX movie "The Last Reef"
January 2009 Director Eric De Fino shoots the first of 2 Music Videos with The Constellations. The first video was the single "Felicia" and was shot on a RED in an undisclosed location in Atlanta. The Consellations - Felicia from Raygun on Vimeo. 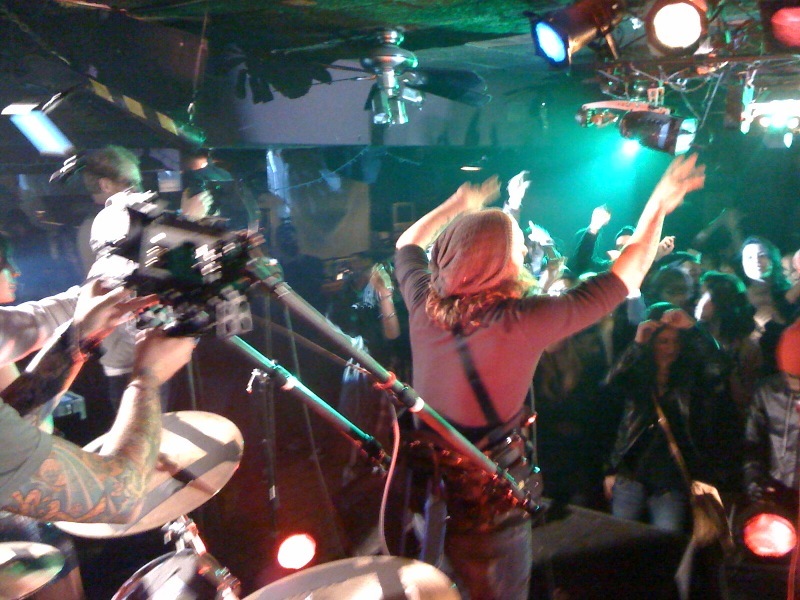 "Set Back" was the second video shot by Director Eric De Fino. 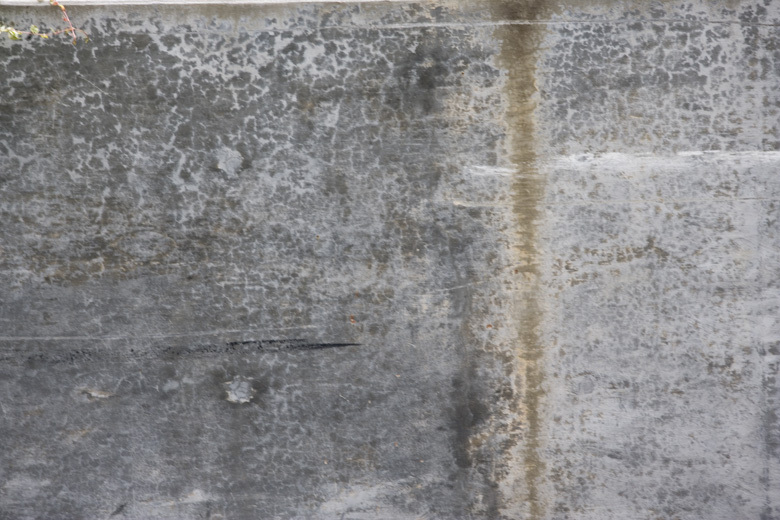 This video was shot in several locations throughout Atlanta over a 4 day period. 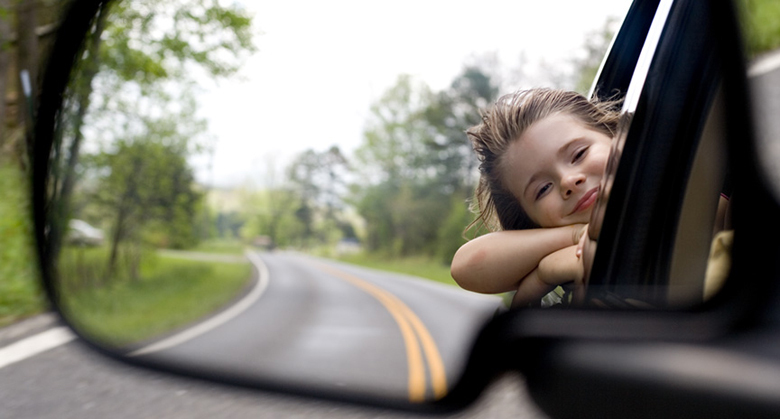 We used a "body rig" and car mount to give this video a certain look. The Constellations - Setback from Raygun on Vimeo. This 2010 season started with a WHOLE new look. 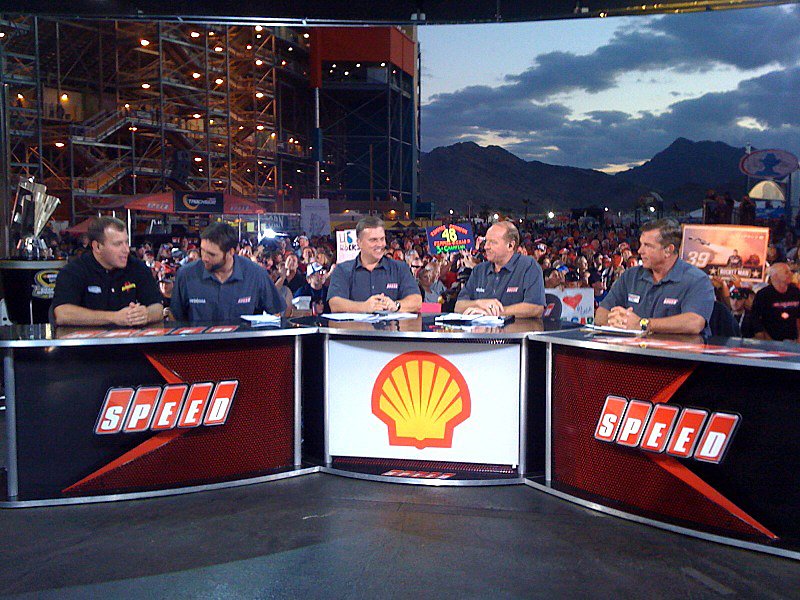 SPEED has a new marketing compound which gives the network more flexibility in shooting the TV shows and the fans more of an opportunity to have some fun. The shows are still the same with the exception of "NASCAR Performance", that will now be shot in Charlotte. 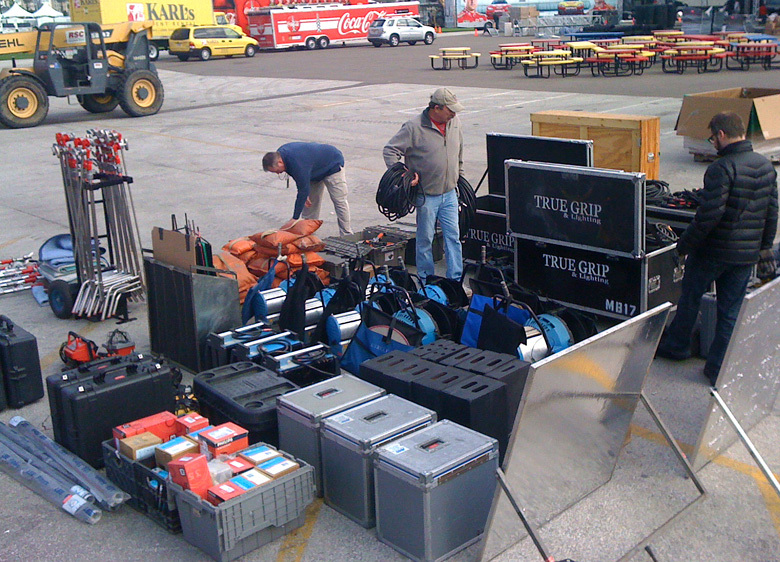 I have ordered all the lighting gear and equipment through True Grip in Knoxville and we start with 6 different shooting locations in Daytona. 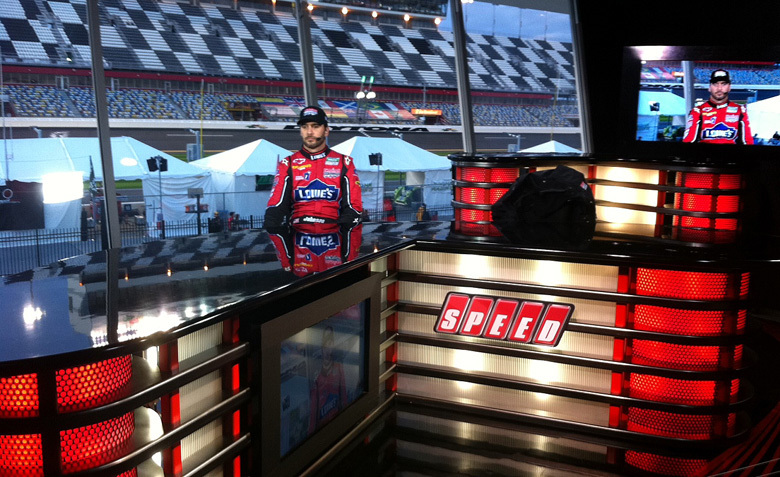 SPEED starts out with a crazy amount of "air time" the first week, something like 100 hours of programing with most of it being shot at the Daytona Super Speedway. We bounce between stages and locations constantly and its a real challenge to keep it all looking consistent. November 2009 my good friend DJ Roller wants me to shoot some dark and creative images for his new 3D RED underwater camera. DJ has put 1000s of hours into the research and design of this first underwater 3D system and is wanting some images for a press release. After going through many options I told him I could shoot his camera at his shop and build the images in my computer. There was no need for a studio or location shoot. He wanted to keep the image as dark and mysterious as possible. 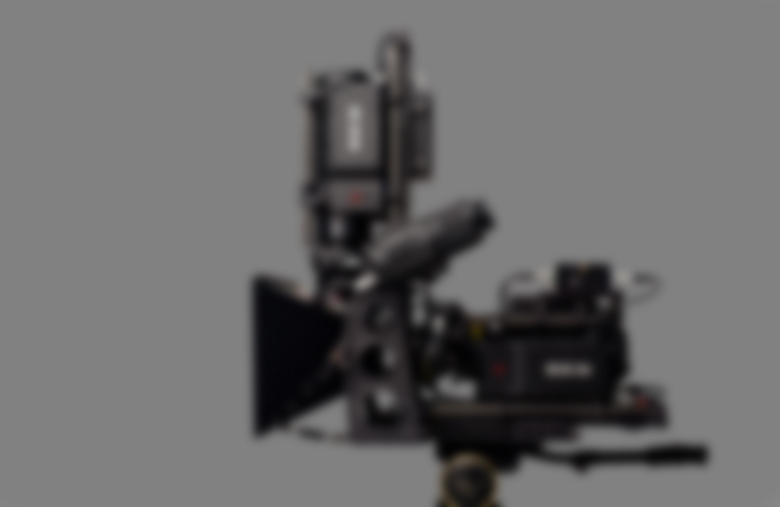 SORRY for the "BLUR" but this camera system is still VERY top secret.. I spend hours cutting the camera out from the grey back ground and then started the feather and airbrush the RED camera system into the final product. I also decided to add a light to it in 1 version so it would appear the camera was in an interrogation room. These are the final versions which were used in his world wide press release and still on the Liquid Pictures website. 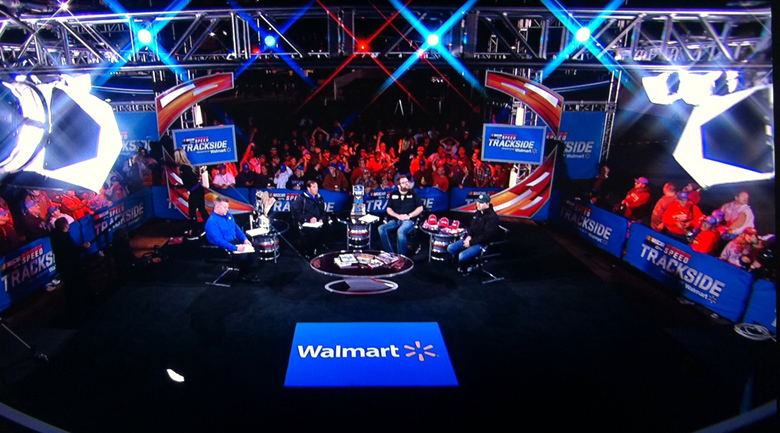 NASCAR "Victory Lane" show's occasional curve ball . . . 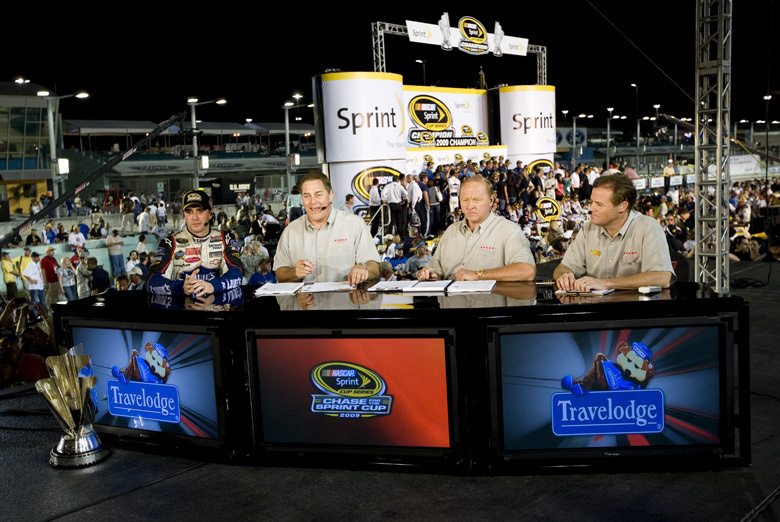 Most NASCAR race tracks have a modern or TV friendly "Victory Lane". That means there is a WIDE pull through with PLENTY of room for the Winning Team, Car, Sponsors, TV Media, Photographers, AND oooo YEAH... our show "NASCAR VICTORY LANE". 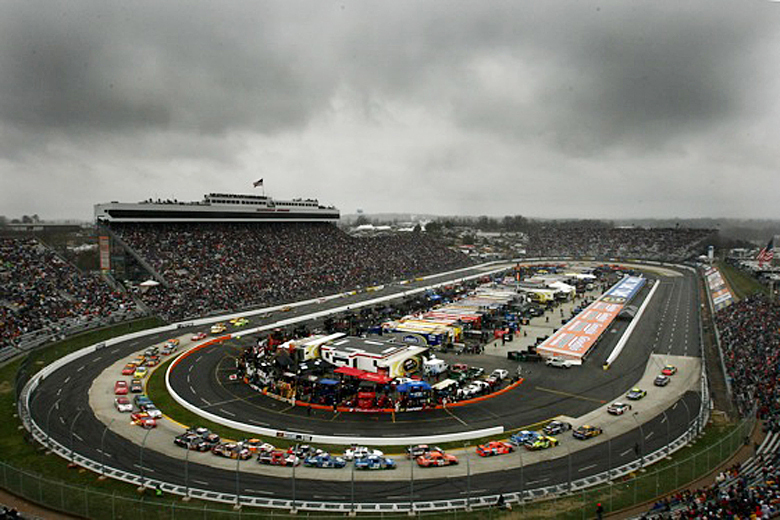 But honestly most of them need a lot of work..
Martinsville Speedway has barely enough room for actual racing series and the supporting People and safety equipment. they call it the paperclip because of its appearance. 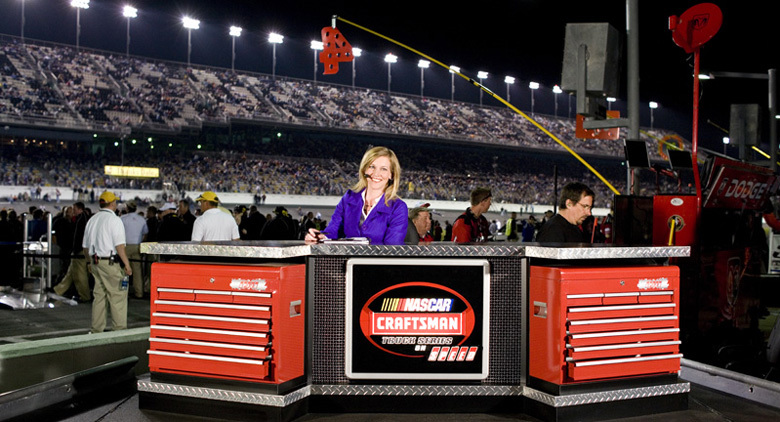 With this in mind, we have to stage ALL of our equipment in a vacant Pit Box. Then wait until the end of the race, the Winning Driver does his victory dance, and then for NASCAR Officials to give us the "OK" sign to jump the wall and do our thing. 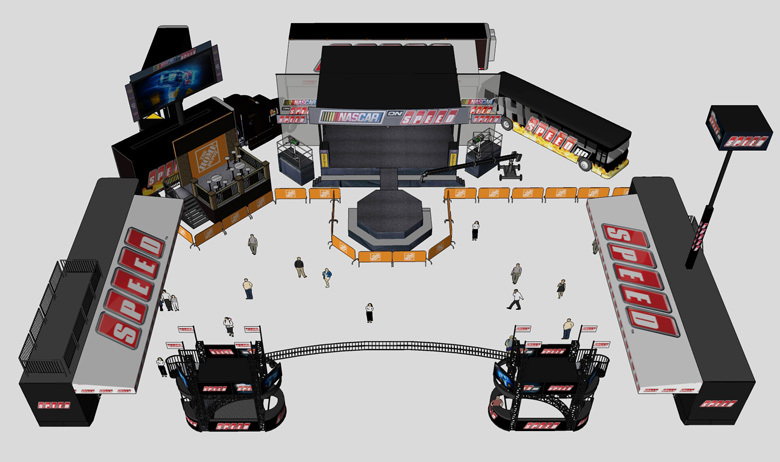 I have just about 10 minutes to get the scene lit for our live show..
That is the generator placed, cabled, lights up, metered, and focussed..
after that we have our fun rolling stage "Victory Lane" which are the AllStar Race in Charlotte, Richmond #2, and the FINALE in Miami..
Our rolling stage is set up behind a Kenworth tractor and we are pulled around the race track toour landing position right at the start finish line. This is always the BEST looking shows of the year. Thats is Tony winning a MILLION BUCKS... He's a happy guy. This particular show I was using LED lighting for the first time on our rolling stage. 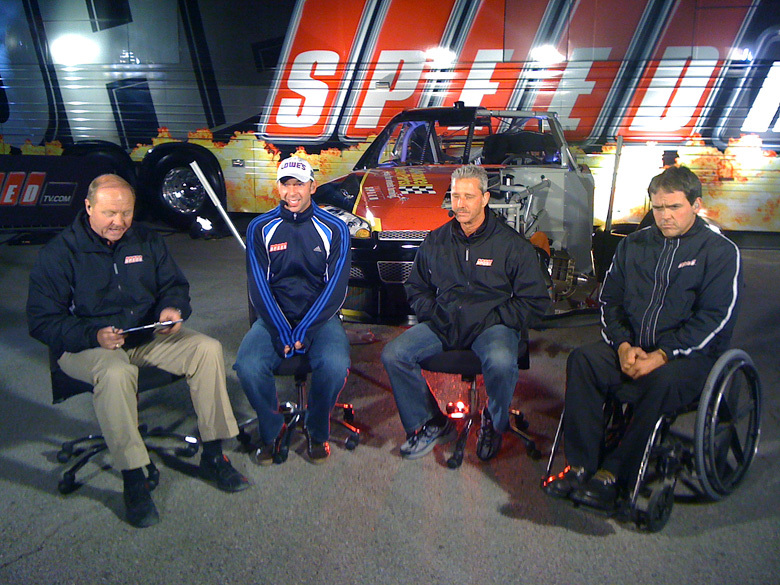 We were able to shoot the show as we drove around the track with the lighting being properely balanced. The previous years we had to wait until we stopped and parked, then we hooked the power up to the Gennie and turned lighting "on". 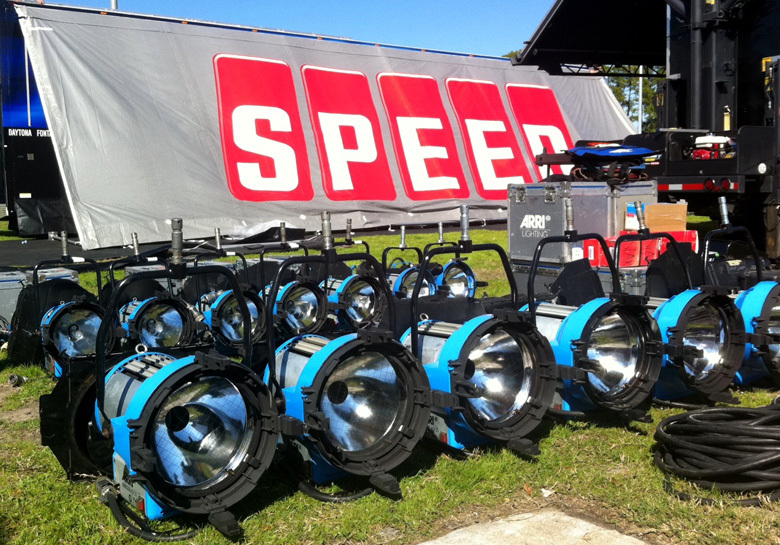 I was one of the Lighting Directors for SPEED Channel and NASCAR for the past 2 years 2007-2008 race seasons. 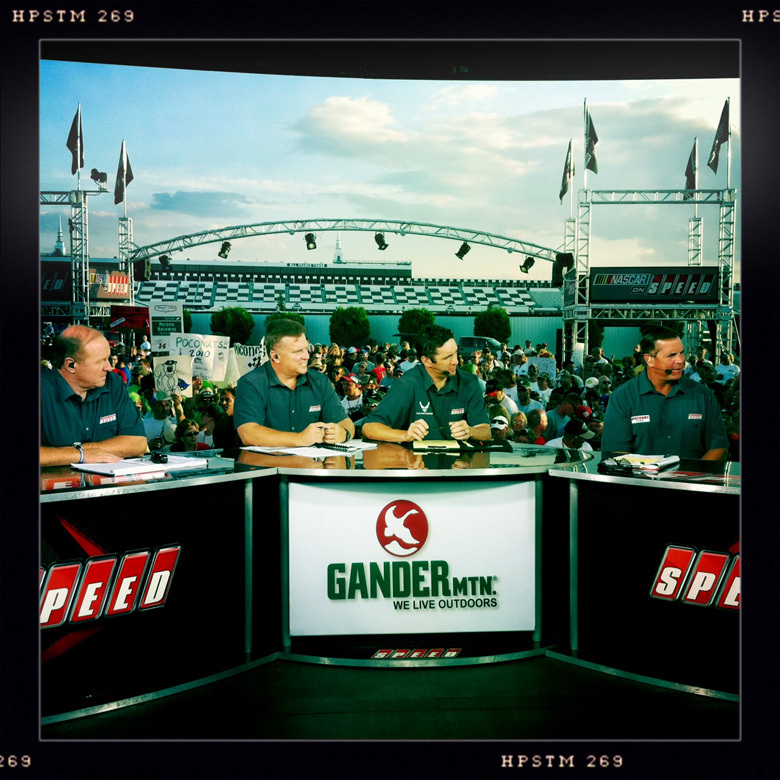 SPEED Channel shoots wrap around shows during the race weekend, with 5 major shows, "Track Side Live", "Race Day", "NASCAR Victory Lane", "NASCAR LIVE", and "NASCAR Performance" shot at different times during the week. Early January in NYC we shoot a music video for an Monika Leigh. 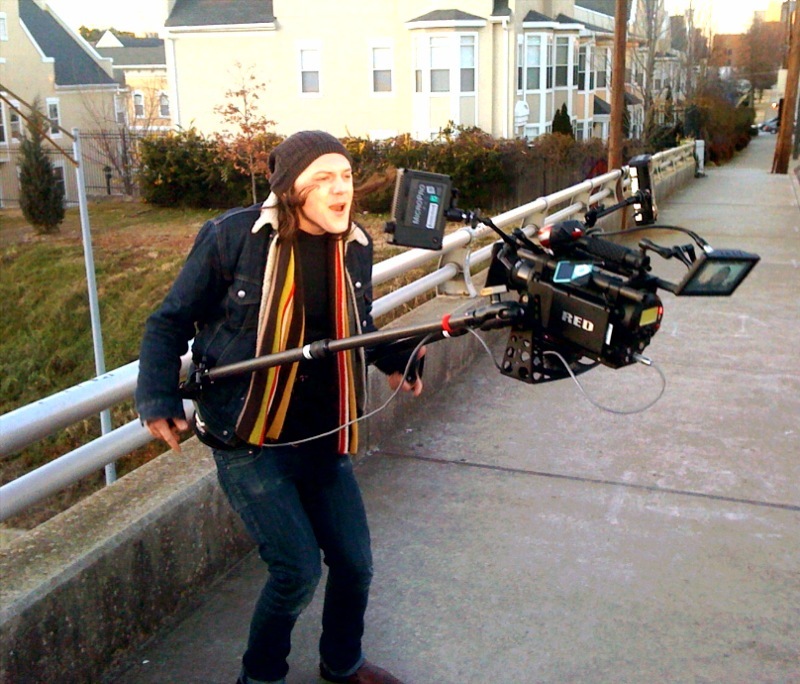 Todd Reynolds directs and produces this set of music videos for her where we spent 4 days shooting in various locations. Monika's voice was amazing and she would play accoustic sets as we set up our shots and light positions. By The River from Monika Leigh on Vimeo. 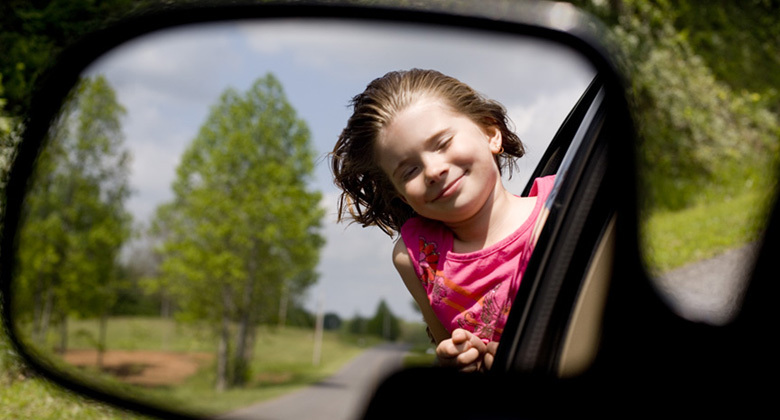 Dust in the wind from Monika Leigh on Vimeo. Just want to be loved from Monika Leigh on Vimeo. Investigation Discovery Launch from Raygun on Vimeo. 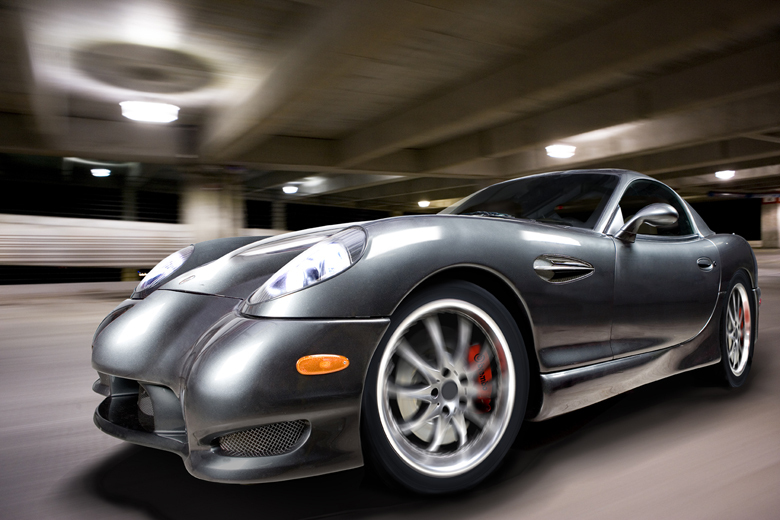 this was a Discovery / Siemens commercial shot in 2007..
Disovery / Siemens Commercial from Raygun on Vimeo. 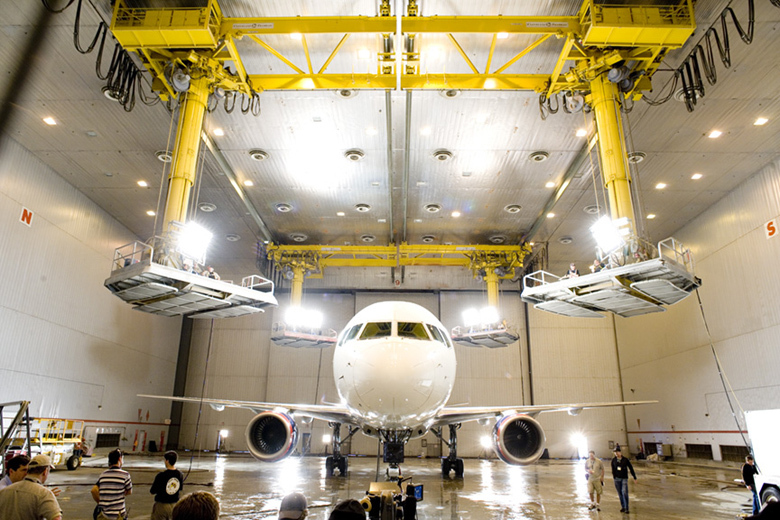 We shot the Josh Bernstein's Discovery Channel promo in NYC at a sound stage in Brooklyn. it was nice, fast, LOVE the food up there.. but glad to get home. Discovery Channel - Into the Unknown from Raygun on Vimeo. don't you wanna be 6 again.. ?? 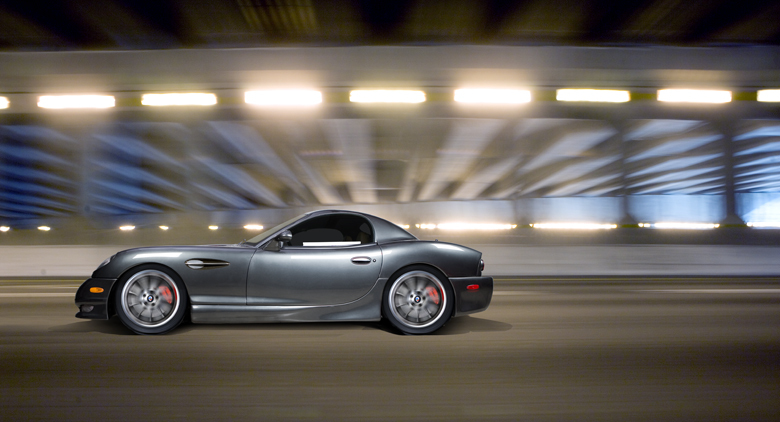 CWP shoots advertising campaign for Panoz Auto Developement in early March of 2008. 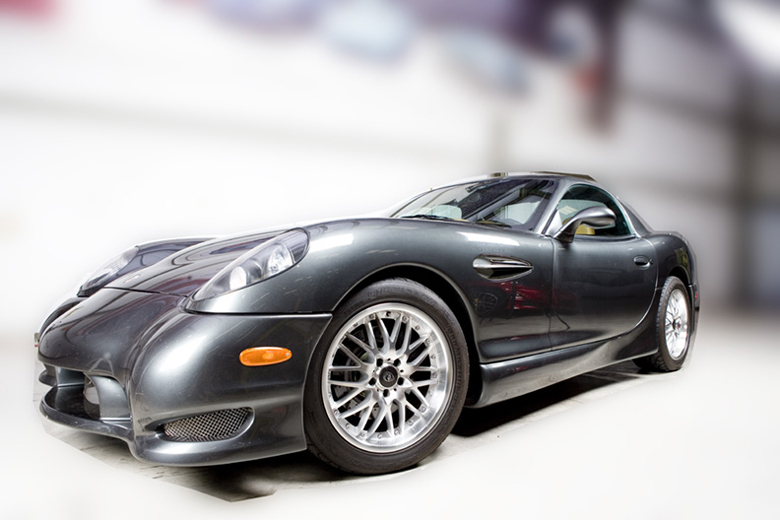 These are some of the composites I have been building for Panoz Auto Developement (PAD for short).. 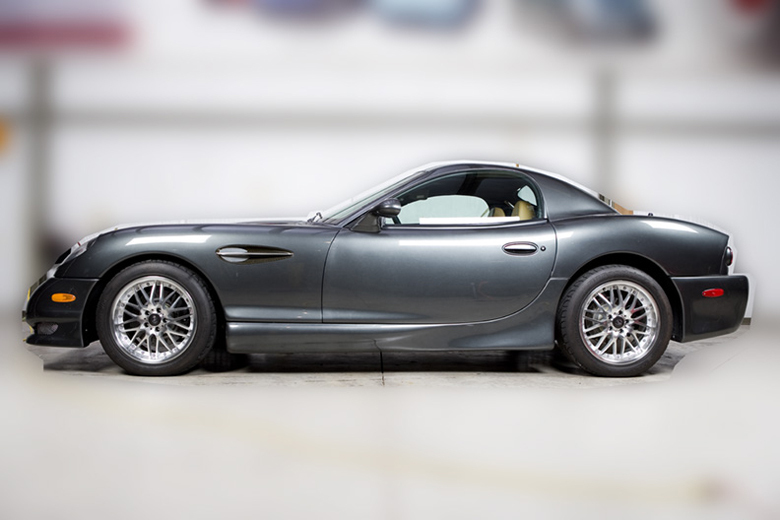 I LOVE shooting composite photography because it really makes you think technically. You have to really understand light and how it works, shadows and exposure are very critical to making and image blend together with no seems and obvious flaws. 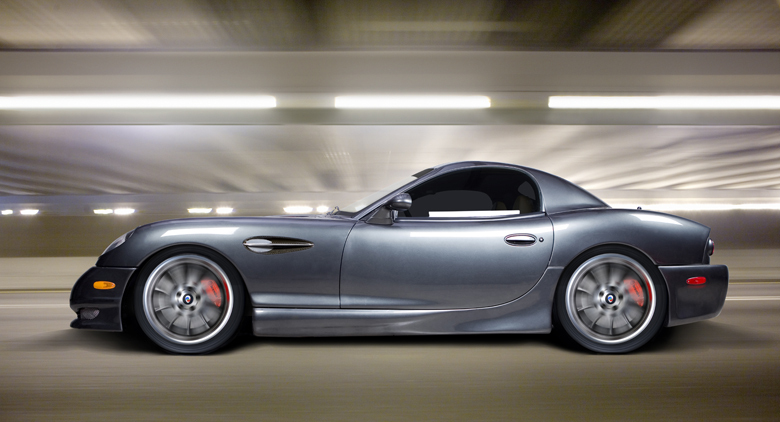 this is the normal car shot in a studio.. I knew what the highway lighting was going to be like, so I lit this car in the same way..
you have to paint out the bad... add some moving wheels and tires.. that was about 8 hours of photoshop painting..
then a parking garage... a little painting and 24 hours later..
My work week was CRAZY and I didnt get to take any photos until the last 3 quarters of the Allstar Race. 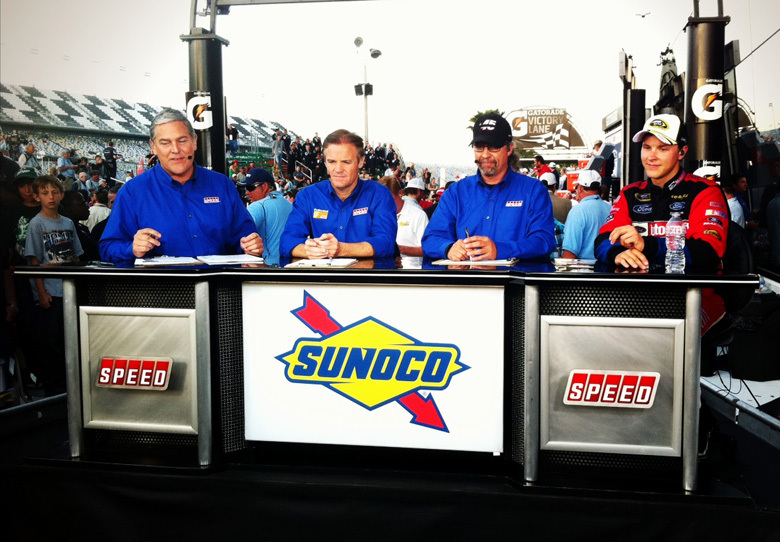 For those of you who were watching all weekend I was the Gaffer for all the TV shows inside the track on "pit road". 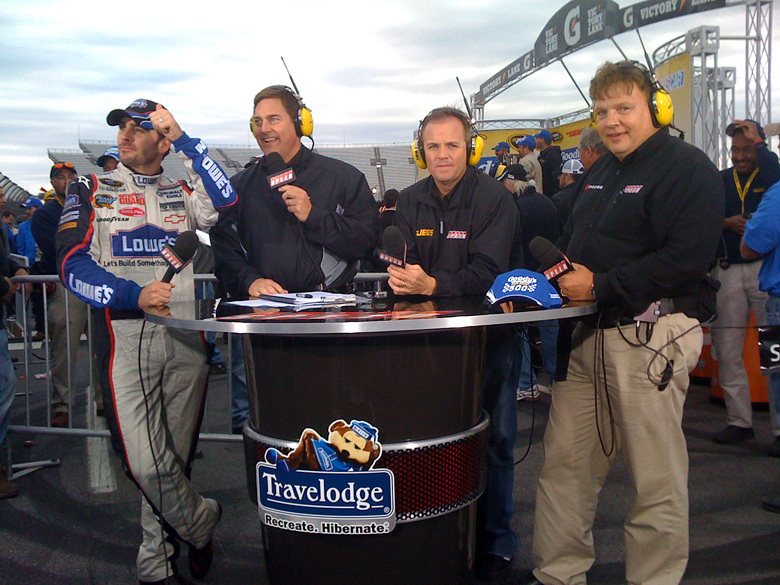 Doug was managing 15 TV shows on 7 different locations.. 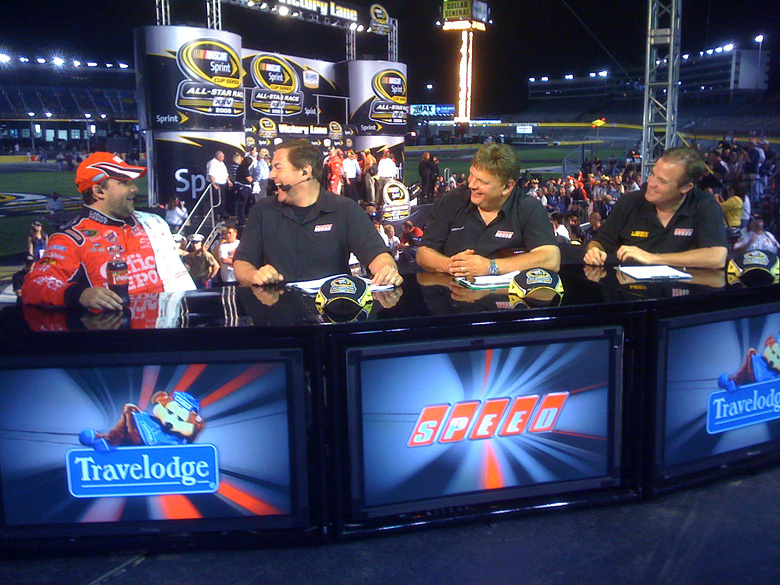 THIS WAS MY MAIN SET FOR THE ALLSTAR RACE. MATT KENSETH RUNNING AWAY FROM THE FIELD.. 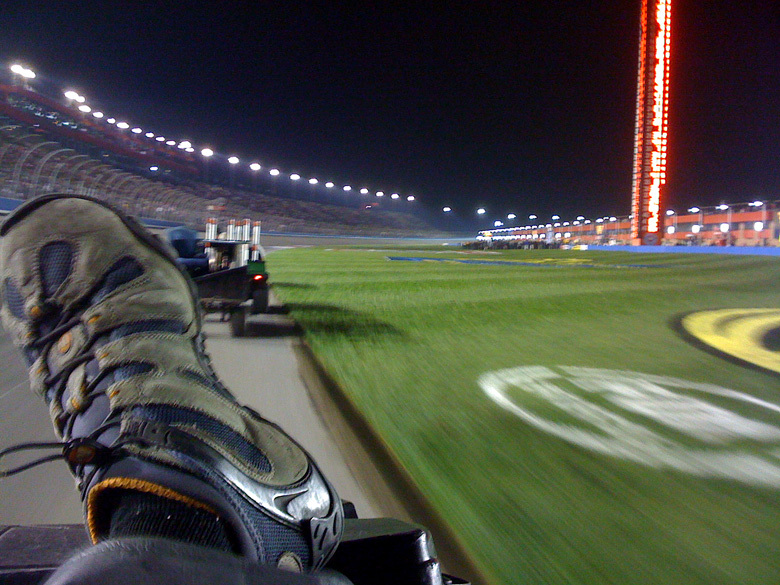 I ALSO GOT TO SHOOT FROM INSIDE THE LOWES RACING PIT BOX..
FIRST SET OF PIT STOPS .. THE LAST SET . . 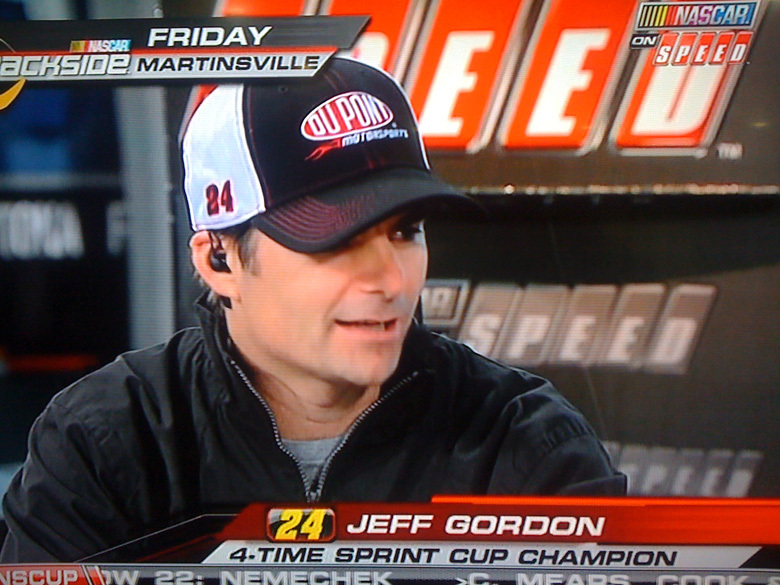 THE LAST FEW HUNDRED FEET AND YOU CAN SEE JIMMY BEHIND HARVICK..
THAT WAS A LOOOOOOOOOOOOOOONG WEEK..
CAN'T WAIT TO GO BACK..
he says... "Wallee, the Couger has landed and we leave on Friday !" John Mellencamp had been a long time fan of Turner Classic Movies and decided he wanted the same Directors and Writers that shot the TCM promos to shoot his next video.. BUT, he can ONLY shoot on Sunday and it has to be at his studio in Bloomington IN. fast forward to Friday afternoon... like ALL TV/Film productions everything seems to firm up last minute.. you need contracts signed, funds transferred, everyone's time schedule is on the change, etc etc... thats just the way it works..
Eric, Dwight, and myself leave at Saturday 1am est.. drive 8 hours and get to Bloomington at 9am..
i drove most of the night and "BIG E" drove the last hour and as we get into Bloomington Eric says,... "If i don't find a Starbucks I'M GONNA TAKE A HOSTAGE !!" Thats my new favorite saying.. "I'm gonna take a hostage..."
sooooooooooooo,... we roll in at 9am.. check in grab some food and GO TO WORK !! YOU GOTTA LOVE OUR BIZ !!! 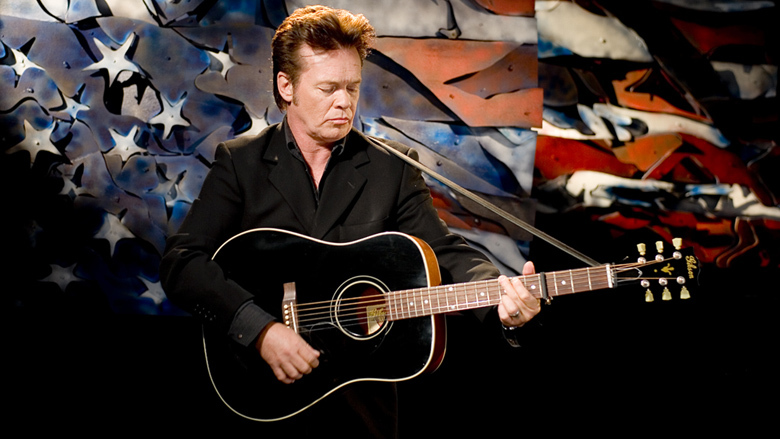 John Mellencamp - The Americans from Raygun on Vimeo. 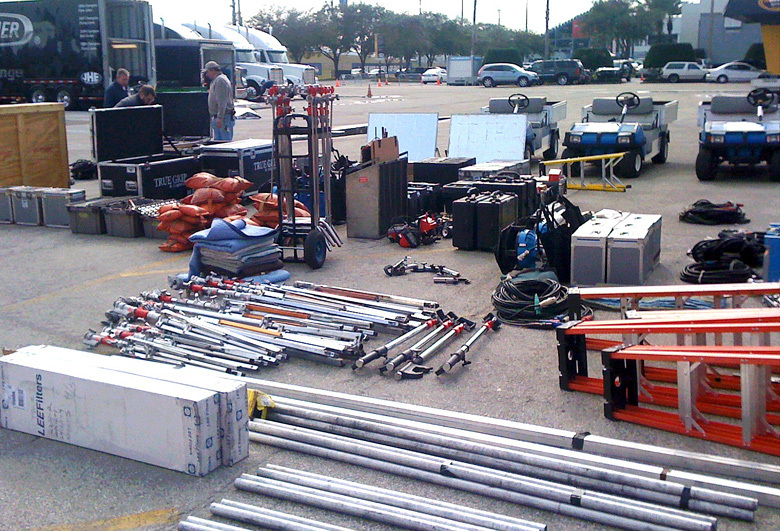 ONE SUPER SIZED SHOOTING SET . .
EVERY NOW AND THEN I GET TO WORK WITH A SUPER TALENTED DIRECTORS OF PHOTOGRAPHY AND PAUL CAMERON SHOOTS BEAUTIFUL IMAGES..
PAUL WAS THE DP FOR FEATURE FILMS LIKE "COLLATERAL", "SWORDFISH", AND "GONE IN 60 SECONDS"
THIS IS GOING TO BE AN AWESOME SPOT..
i thought i would blog some of fun jobs i get to work on, and this was an awesome shoot with the exception of the weather. 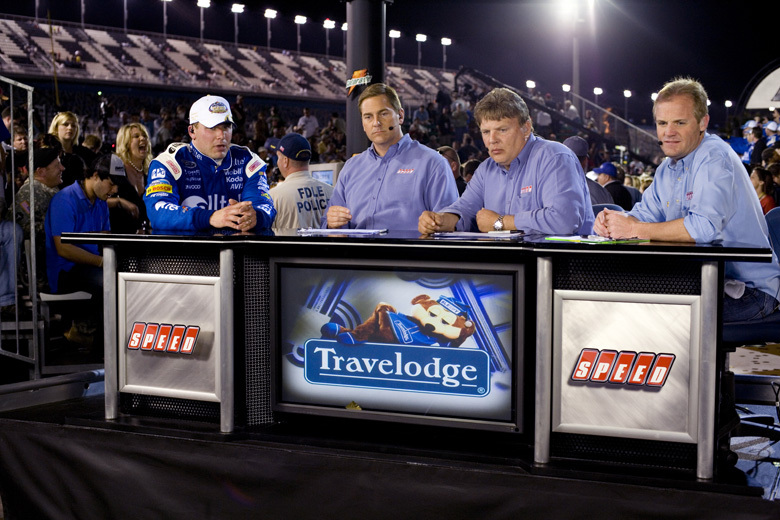 This is a commercial for Chevy and NASCAR, we had drivers Dale E Jr., Tony Stewart, and R&B Artist T.I. the basis of the spot is that Jr. is racing around town in his new Chevy Impala driving like a maniac while T.I. is driving Jr's number 8 car on the track. you dont know this till the end when thry both get out and switch cars. but T.I. 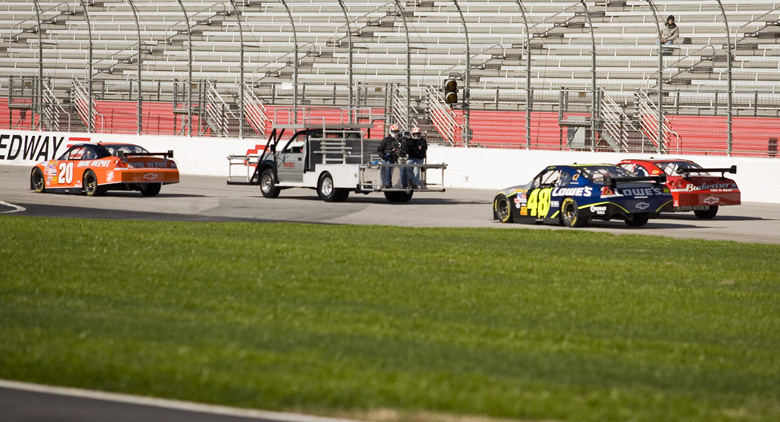 is putting around the track while the whole field is passing him by at racing speed. due to the magic of Editting we ran at 1/2 race speed and they will speed it up in post to make it look like its SUPA fast..
we were rained on for 3 days and i didnt take my camera out until the last day it was sunny. 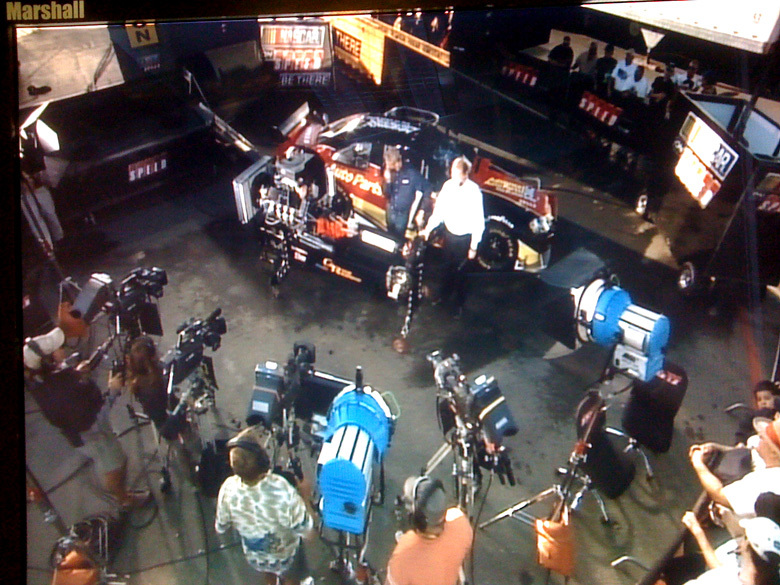 these are photos of the "Shotmaker" camera car and another set up where we layed the camera dolly just outside of the Finish line. THE DIRECTOR AND DP BOTH WERE FROM L.A. VERY NICE PEEPS. JOSH SETTING A HEAD SLATE FOR THE CAMERA "A"
A FEW CARS PASS T.I. AND STEWART STOPS AND SAYS W.T.F ?? A REVERSE SHOT CAMERA "B". 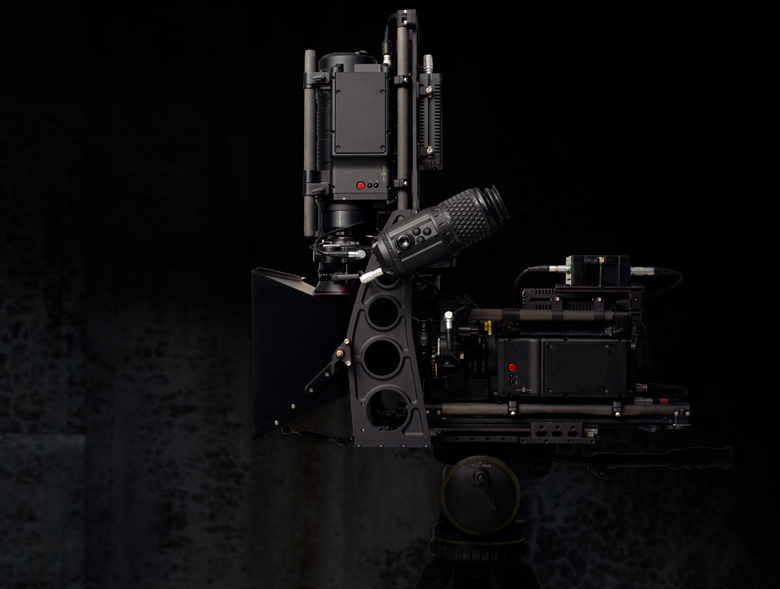 THIS IS ONE OF THOSE COOL CAMERA RIGS WE BUILD... THE DIRECTOR SAYS "I WANNA CAMERA OUTSIDE ON THE TRACK WITH A DOLLY MOVE, CAN YOU MAKE THAT HAPPEN ??" 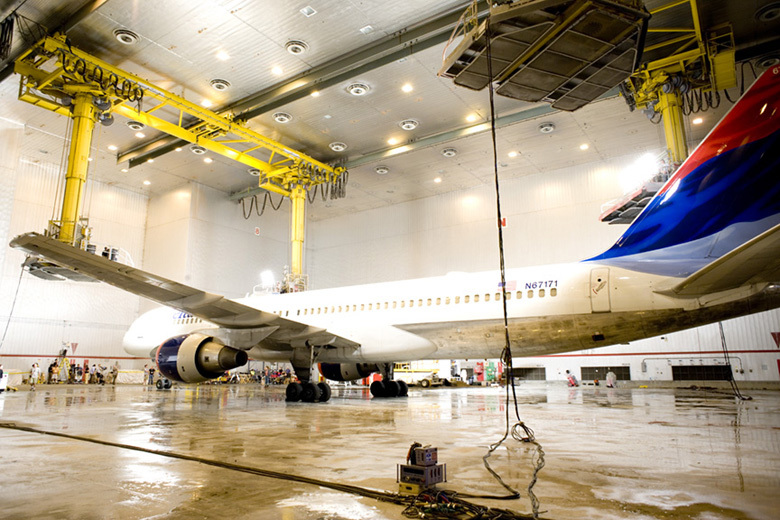 THATS ABOUT $400,000 WORTH OF EQUIPMENT, NOW THATS COOL !! 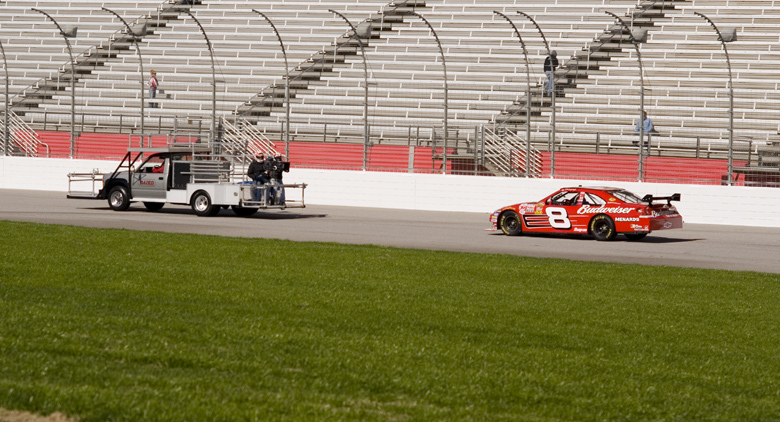 KEVIN HARVICK'S 29 CAR MAKING A PASS WHILE THE KEY GRIP DAVID HULSEY GIVES THE CAMERA A LITTLE MOVE AS IT PASSES BY.. 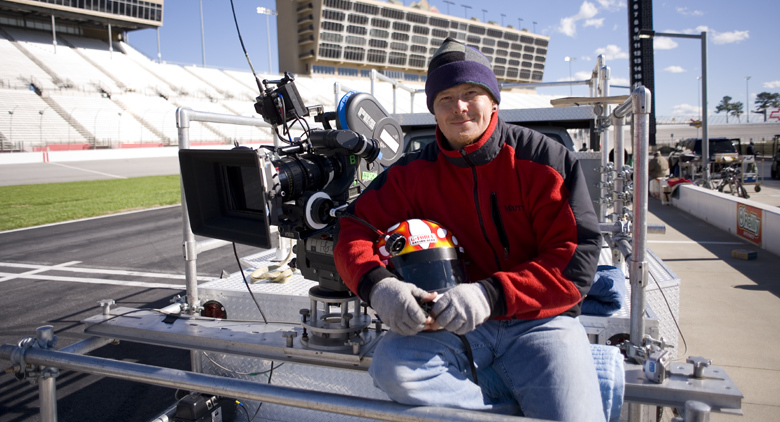 This was a COLD night in December 2007 when we shot this commercial for the new "I D" Discovery Channel launch. Eric was shooting on his Panasonic w/ Red Rock adaptor and high shutter speed rate. We had been using his camera system for a couple of years now and I knew what to expect as far a my fStop math and formulating equipment for this shoot. 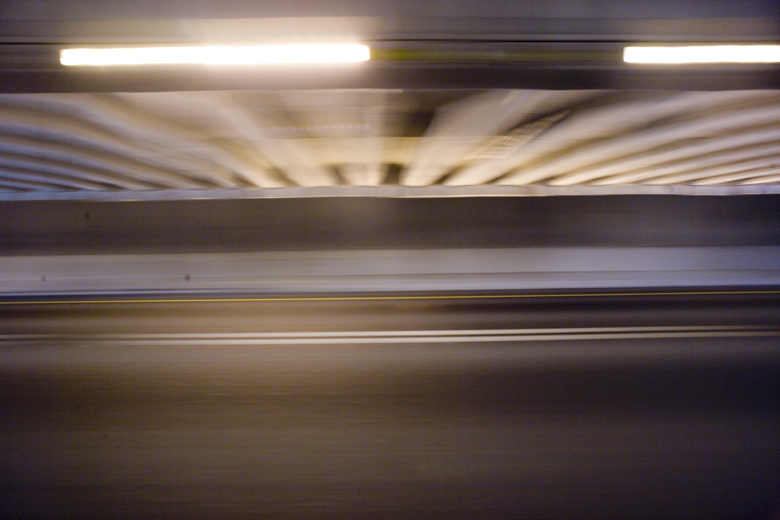 We were shooting in multiple locations but the biggest set up was under a bridge in down town Atlanta one cold night. I had to work off the math basis of the camera shooting at 40 ASA / ISO, WOW !!. We had had enough light to light up several square blocks,.. 18k HMIs, MaxiBRUTES, 6K HMI pars, and multiple Gennerators.. I had a great Crew and it turned out very nice..